Tori Mitchell, a Freshman for the Midshipmen, scored he r first goal in the 88th minute against Howard, to tie the game. The Midshipmen eventually went on to win the game. 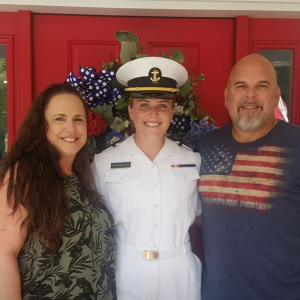 Congratulations Tori, the Tampa Bay Navy League continues to be proud of your accomplishments. GO NAVY! 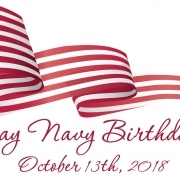 Reserve your seats for the celebration of the 243rd birthday of the US Navy. See the events page for details. 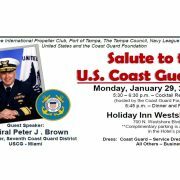 Tonight, May 15, 2018 our Council celebrates with local Maritime Academy Appointees and NROTC Scholarship winners at the Holiday Inn Westshore. 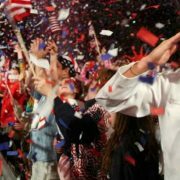 Our Eighth Annual Celebration will recognize 4 young men and 3 women with appointments to the U.S. Naval Academy, 1 young lady with an appointment to the U.S. Coast Guard Academy, 1 young man with an appointment to the U.S. Merchant Marine Academy and 2 young men who have been awarded NROTC scholarships. 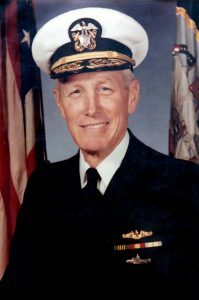 Our honored guest and speaker for this evening will be Rear Admiral Sinclair M. Harris (retired). Rear Admiral Sinclair Harris is a native of Washington D.C. He is a 1981 graduate of James Madison University in Harrisonburg, Virginia, where he received a Bachelor of Science in Economics. 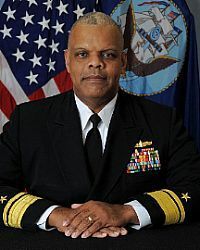 His early sea assignments include tours aboard USS Long Beach (CGN 9), USS Vincennes (CG 49), USS Jarrett (FFG 33), USS Coronado (AGF 11), and as commissioning executive officer in USS Benfold (DDG 65). Please help us Congratulate these future leaders and their families. 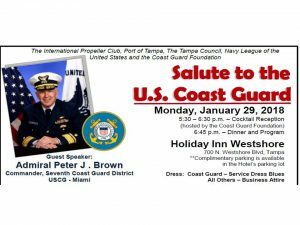 Tampa plays host to NAVY WEEK this year. Our Council is hosting a reception for the Admirals who will be visiting our city. The event will be held on Tuesday, 8 May at 7:00 p.m at the Westshore Holiday Inn, 700 N Westshore Drive, Tampa 33609 All Tampa Bay Council members are welcome to attend. USCGC TAMPA returns to Tampa, FL. Saturday, Feb. 3, 2018 at 10 a.m. The story of USCGC Tampa, leading up to its fateful voyage near the end of World War I that killed 115 sailors, including 24 Tampa men, soon will be told on an exterior wall at the Tampa Bay History Center. Hillsborough County’s Public Art Program is paying $75,000 for the stained-glass mosaic at the downtown Tampa museum. 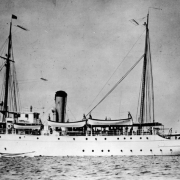 In pictures and words, it will describe the ship and its crew – from the cutter’s launch in 1912 as the Miami, to participation in Gasparilla celebrations from 1913 to 1917 and rechristening as USCGC Tampa, to iceberg patrol, to its transfer to the Navy when the United States entered WWI in April 1917. Refitted with larger weapons and painted Navy gray, the 190-foot Tampa watched for German submarines as it escorted 18 convoys of merchant vessels off the western coast of Europe during the war. On Sept. 26, 1918, while leading a convoy from Gibraltar to Milford Haven, Wales, a torpedo struck the ship. She sank, and all hands on board perished. It was the single greatest combat loss to the Navy in WWI. Tampa residents were devastated. The ship and its crew had become fixtures at Gasparilla festivities, firing the cutter’s cannons at a mock pirate ship during the latter vessel’s annual “invasion” of the city. The booming exchange initiated the tradition of gun blasts that continues today. The Tampa’s appearance also served as a Coast Guard recruiting tool, which largely is why two dozen local men were crew members. Now, 100 years after the Tampa sank in Bristol Channel, killing the sailors and 16 passengers, The Tampa Bay History Center is honoring the ship and her crew. On Feb. 4, one week after the annual Gasparilla Invasion & Parade, dignitaries and residents will gather at the History Center to dedicate the mosaic. The 10-by-22-foot display will be on the History Center’s west wall, overlooking Cotanchobee Fort Brooke Park. The History Center is near the site of the Tampa’s berth when the vessel was in Tampa. The current USCGC Tampa, based in Portsmouth, Virginia, will be here for Gasparilla festivities and the mosaic’s dedication. Launched in 1984, the newer 270-foot ship’s motto, “Thy way is the sea, thy path in the great waters,” was lifted from an Arlington National Cemetery memorial to the vessel’s long-submerged predecessor. A book, USCGC Tampa, Tampa’s Own, available at the Tampa Bay History Center, tells a detailed story of the ill-fated vessel, and is dedicated to the crew of the current USCGC Tampa. Its author, Robin Gonzalez, has distributed the book to high schools throughout Hillsborough County. When: Saturday, Feb. 3, 2018 at 10 a.m. Event Details: Admission is free. Following the ceremony, guests may view an exhibit on the USS Tampa in the History Center’s TECO Learning Center, free of charge. An admission fee is required to view the museum’s other exhibition galleries. http://www.tampabaynavyleague.org/wp-content/uploads/2018/01/mosaic-1_nr.jpg 475 845 Jason Allen http://www.tampabaynavyleague.org/wp-content/uploads/2016/03/NLUS_Logo_Color-180x180.jpg Jason Allen2018-01-22 15:58:552018-05-18 09:29:04USCGC TAMPA returns to Tampa, FL. Saturday, Feb. 3, 2018 at 10 a.m.
Sunday, January 28, 2018 – 2:00 p.m. The United States Navy will commission the first of a new generation of aircraft carriers into service later this month on July 22. 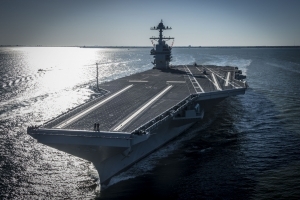 When she is commissioned, the future USS Gerald R. Ford (CVN-78) will represent the future of naval aviation and will be the most advanced and capable aircraft carrier ever built. With Ford’s imminent commissioning ceremony coming up later this month, the Navy invited The National Interest to preview the mighty warship and see the new vessel’s technology firsthand on July 10. Even at first glance, PCU Gerald R. Ford is an impressive sight even as she was moored pierside at Norfolk Naval Station in Virginia next to older Nimitz-class carriers USS Dwight D. Eisenhower (CVN-69)—one of America’s oldest flattops, USS George Washington (CVN-73) and USS Abraham Lincoln (CVN-72). Immediately noticeable is that Gerald R. Ford’s island is not only smaller than that of the Nimitz-class carriers, but that the structure is set further astern by about 140ft and slightly further starboard. Moreover, unlike regular fleet carriers, the brand-new Ford is still in pristine condition and sports a gold-painted anchor—a badge of honor noting that she has an exceptionally high crew retention rate. Entering the massive vessel via one of her three aircraft elevators—Nimitz-class ships have four—into her cavernous hangar bay, Ford’s interior looks similar to that of other carriers. However, whereas the Nimitz-class has three partitions in their hangar bays, the new CVN-78-class has only two in order to simplify maintenance. As we walked into the interior to climb up to the bridge, the air conditioning is immediately noticeable. Ford is able to produce 9,900 tons of air conditioning—which not only makes for a more productive crew but should reduce maintenance requirements for new vessels because of reduced humidity. Indeed, the key tenant of the entire CVN-78-class is improved maintainability and efficiency. Unlike previous carriers, Ford is projected to enter drydock only once every 12 years. Climbing up into Ford’s bridge, the systems are far more advanced than anything else in the Navy’s fleet other than the new Zumwalt-class guided missile destroyers. All of the controls and navigational systems are completely digital and use touch-screen interfaces. The only concession to the past is a metal wheel connected to an electronic steering and transmission system—though the ship does have backup systems. The entire ship features far greater automation—with far greater reliance on electrical and electronic systems—than any other carrier in the fleet. To power her systems and to meet future growth requirements, Ford’s twin nuclear reactors are almost three times more powerful than the ones onboard the Nimitz-class—generating 250 percent more electricity. 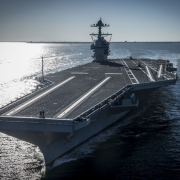 Indeed, sister PCU John F. Kennedy (CVN-79)—currently under construction—will adopt electrically-powered elevators, further reducing the need for hydraulic systems. Primary flight control—which is a few more decks up on the island—is similarly high-tech, but aside from a few modifications to the firefighting system—the setup is very similar to the Nimitz-class according to Lt. Commander Jon Biehl, Ford’s mini-boss (deputy air boss) and Boeing F/A-18 Super Hornet pilot. Biehl said he is very confident in the new carrier’s systems though the ship has yet to be tested in launching and recovering real aircraft. “Very confident, it’s proven to be successful,” Biehl said. Several decks down in Flight-deck Control, I was surprised to see a traditional “Ouija board,” which visually indicates the position and status of aircraft on the ship’s flight deck using scaled aircraft templates and various pins and washers. Ford has automated systems that track the location and status of the ship’s aircraft, but the crew setup the Ouija board as a manual backup—and for the sake of tradition. “We kept the Ouija board for guys just like you that come into flight deck control and it’s just not flight deck control if the Ouija board is not here,” Lt. Commander Jamie Roman, Ford’s aircraft handling officer told me. Our next stop was the flight-deck, which we reached via the hangar bay via one of Ford’s three aircraft elevators. Ford’s rearranged and reconfigured flight deck—which is 1,106ft long and somewhat wider than the Nimitz-class’—visibly looks and feels considerably larger than that of previous generation aircraft carriers. Underneath, the massive steel deck, Ford is equipped with four Electromagnetic Aircraft Launch Systems (EMALS) and an Advanced Arresting Gear (AAG) which are replacing their steam and hydraulically driven equivalents onboard the Nimitz-class (and which allows for unrestricted operation of the #4 catapult). The ship also features 40 refueling stations and a revised configuration for her weapons elevators. The ship could achieve between 25 and 33 percent greater sortie generation rates than her predecessors once she has been fully tested according to Navy projections. Capt. Brent Gaut, Ford’s executive officer, said that the next steps for the ship and her crew after commissioning will be to move into the test and evaluation phase. By the end of July, the ship is expected to set sail for a 10 to 12-day shakedown period where the crew will begin to test all of Ford’s systems including the EMALS and AAG. If all goes well, the ship will be certified to launch and recover aircraft by the end of September or early October. “The systems I think, in theory, are just phenomenal and designed to perform a certain way,” Gault said. Capt. Rick McCormack, Ford’s commanding officer, said that the ship has already tested the EMALS and AAG with dead loads, and as such, he is very confident that the systems will work as advertised. Indeed, both systems have proven themselves in testing, but the Navy has to be certain that they meet operational standards at sea. “I’m very very confident that the EMALS will do everything we need it to,” McCormack said. As McCormack explained, the Navy will use the post-commissioning shakedown to test all of the new systems onboard Ford to identify any deficiencies or fixes that might need to be made. Ford will then move into a post-shakedown availability where the shipyard will make any needed corrections and install certain critical components onboard the ship that have yet to be installed. One such system is Ford’s Dual Band Radar, McCormack said, where there is still ongoing work that must be completed. Subsequently, the ship will then go out to sea for another shakedown cruise to ensure that all of the corrections and new systems work properly, McCormack said. If all goes well, the ship should be operational by 2020. If the current schedule holds, Ford should be able to work up with an air wing and deploy in 2021 or 2022. “All this stuff takes time, so in an ideal world—where everything works right the first time—we go out there and everything works great, you’re on timeline,” McCormack said. Ford seems to be delivering on the promise of a more efficient carrier that will take naval aviation into the future. Ford—which is based on the Nimitz-class hull form—restores weight and stability margins by reconfiguring the ship’s interior, though she displaces roughly 100,000-tons just like the CVN-68 class (Indeed, one officer noted that while a sea, Ford is much more sporty than the Nimitzthanks to her prodigious horsepower and reconfigured interiors). But more importantly, Ford adds improved survivability measures while reducing manning and maintenance requirements. If all of Navy’s projections are realized, the service will save $4 billion in total ownership costs over the life of the ship. For operators like McCormack—a career Boeing F/A-18E/F Super Hornet pilot—they just want to take the ship out and launch jets. Indeed, McCormack said that he wants to be among the first aviators to “trap” onboard Ford. “As an operator, I just want to go to sea,” McCormack said. The RFI lays out a ship that opens the door to almost any existing design that can be adapted to the Navy’s needs, which extends beyond just the two LCS hull forms being built by Lockheed Martin and Austal USA. The Navy is looking to avoid “sticker shock,” said Rear Adm. Ronald Boxall, the service’s director of surface warfare, said in a Monday telephone interview, and engage with ship builders about what trade-offs the Navy would have to make to get the most capability from the ship. “A competition for FFG(X) is envisioned to consider existing parent designs for a Small Surface Combatant that can be modified to accommodate the specific capability requirements prescribed by the US Navy,” it reads. Other capabilities in “tier two” include various sonar equipment such as variable-depth and towed-array sonar, Cooperative Engagement Capability to be able to share target data with other ships and aircraft in the fleet, rigid-hull inflatable boats, Next Generation Surface Search Radar, and a MK 110 57mm gun and related systems. The U.S. Navy wants the ship to be used for surface and anti-submarine warfare — traditional frigate roles — and to take on lower-level missions, such as security cooperation, that don’t require multibillion-dollar warships. It also must be hardened against electronic warfare attack. The U.S. Navy intends to award the contract for the first FFG(X) in 2020. It will buy one in 2020 and one in 2021, followed by two each year after that. The U.S. Navy’s requirement is for 52 small-surface combatants, the bulk of which will be LCS. This story is developing. Check back later for more coverage, including a Q&A with Rear Adm. Boxall on the new design. President Donald Trump unveiled his second nominee for secretary of the Navy late last week, and it was a name that had been rumored for months. Richard V. Spencer, a finance executive with roots in military philanthropy, will go before the Senate for confirmation as the next civilian to oversee policy for the Navy and Marine Corps. Here are five things to know about Spencer. 1. After college, he was a Marine Corps aviator from 1976 to 1981, serving with the Southern California-based 3rd Marine Air Wing and getting out as a captain. He then spent most of his career in finance and venture capital firms on Wall Street and elsewhere. 2. In 2010, he was the architect of a plan to close military commissaries in the United States to save taxpayers an estimated $1 billion a year. At the time, Spencer was a member of the Defense Business Board, an appointed group that gives private-sector advice to the Pentagon about business practices. He later told the Washington Post that then-Defense Secretary Robert Gates told him, “Richard, my fax machine is vomiting letters of complaint.” Worried that congressional anger would doom other Pentagon cost-cutting initiatives, Gates told Spencer to drop his commissary plan. 3. Spencer has links to the top tiers of the Marine Corps and Navy through volunteer work on boards and philanthropy for veterans. He is vice chairman of the nonprofit Marine Corps Heritage Foundation, which was the driving force behind building the National Museum of the Marine Corps in Virginia. He has served on the executive panel that advises the chief of naval operations. Spencer is also an adviser to the Washington think tank Center for a New American Security, which provided some high-level executives to the Obama administration. Additionally, he is on the board of Honoring Our Veterans, a Wyoming-based program to help returning wounded vets. 4. He lives just outside of Yellowstone National Park in Wilson, Wyoming — a state not known for its naval bases. 5. When Spencer’s nomination was announced, a white nationalist with a similar name had a field day on Twitter. The question facing the real nominee is whether he will have to withdraw due to his financial ties butting up against Pentagon ethics rules — as the prior nominee, Philip Bilden, did back in February. Trump is still trying to fill the Army secretary job, as well.